This chest of drawers is both practical and stylish. 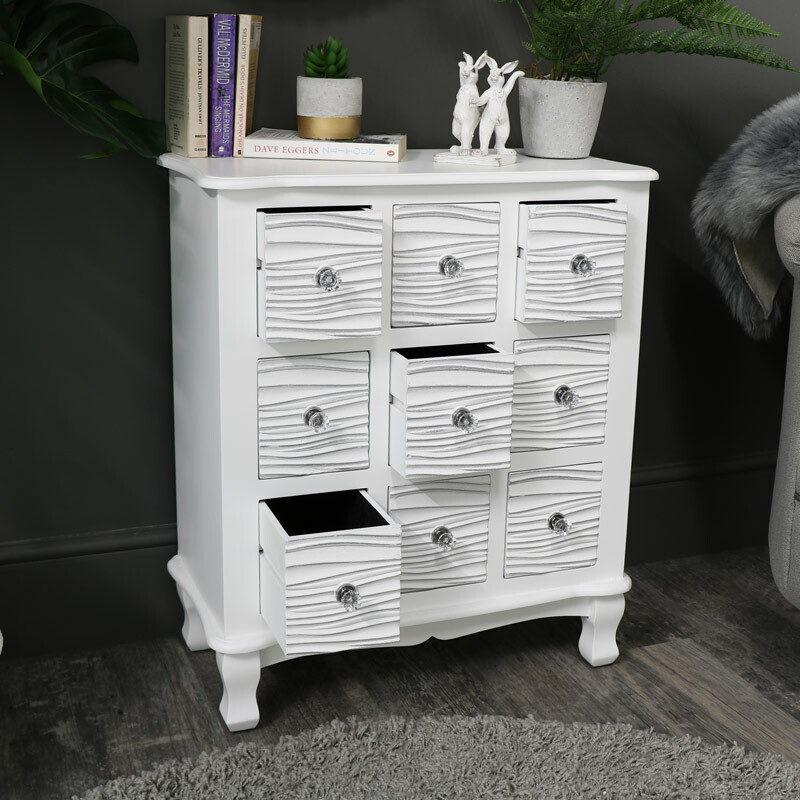 Painted in a satin white finish with 9 drawers, this chest offers a great storage solution for the living room, hallway and bedroom. A modern twist on the vintage apothecary style storage chests. This piece of furniture offers super storage with 9 drawers. Beautiful modern, contemporary design with carved ripple design, highlighted with delicate silver brush strokes, decorating the drawer fronts and finished with cyrstal drawer knobs. Perfect for adding some extra storage for any room. This chest would easily complement modern, contemporary or traditionally styled interiors. This chest of drawers is both practical and stylish. 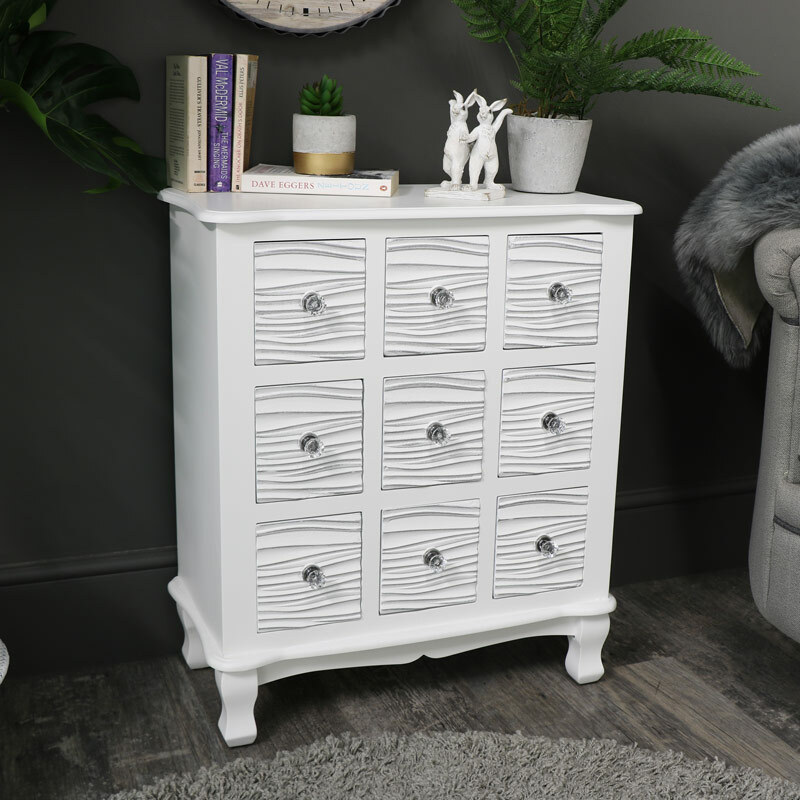 Painted in a satin white finish with 9 drawers, this chest offers a great storage solution for the living room, hallway and bedroom. A modern twist on the vintage apothecary style storage chests. This piece of furniture offers super storage with 9 drawers. 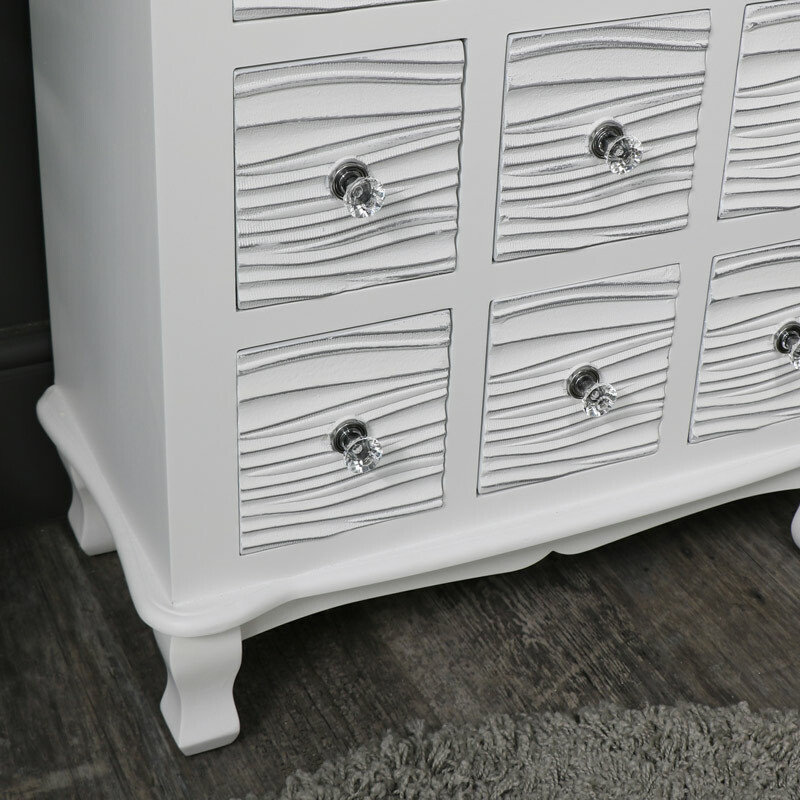 Beautiful modern, contemporary design with carved ripple design, highlighted with delicate silver brush strokes, decorating the drawer fronts and finished with cyrstal drawer knobs. Perfect for adding some extra storage for any room. This chest would easily complement modern, contemporary or traditionally styled interiors. Constructed from wood with the body painted in a white satin painted finish. Each of the nine drawers come with wooden runners and ripple effect fronts, crystal style drawer knobs finish off the look. The chest comes fully assembled so all you need to do is unbox and place wherever you want. This chest is just one of many storage solutions we have to offer. Make your home beautiful and stylish with so many options to choose from with the classic French to the retro, industrial look to the more modern and contemporary designed furniture.